Current Status: active; surrendered 08/19/1999; restored 06/23/2012. By Worshipful Alden B. Ackerman. Some time prior to the year 1925, the idea of a Masonic Lodge having jurisdiction confined to Boston University, originated in the Boston University Square and Compass Club and, no doubt, was stimulated by the successful formation of similar Lodges at Massachusetts Institute of Technology in 1920 and at Harvard University in 1922. The first definite action taken was at a meeting of the Club held in May, 1924, when a committee was appointed to inquire into the practicability of the proposal. The report of that committee was sufficiently favorable to cause the securing of signatures to a petition to the Grand Master for a dispensation. Brother Harold C. Spencer was President of the Club at the time and also Chairman of the committee on the formation of the new Lodge. It has been said that he, more than any other person, had the interest, imagination and persistency to carry the proposal to fruition. In February, 1925, the petition, bearing eighty-six names, was ready for presentation to the Grand Master, and those who waited upon him were Worshipful Arthur W. Weysse, a Past Master of Amicable Lodge, a Charter Member and Past Master of Richard C. Maclaurin Lodge, a Charter Member of The Harvard Lodge, and the proposed first Master of Boston University Lodge; also Brother Harold C. Spencer, the proposed Senior Warden of Boston University Lodge; Brother Everett W. Lord, the proposed Junior Warden of Boston University Lodge; and Right Worshipful Arthur Earl Fisk, District Deputy Grand Master for the Second Masonic District. The Grand Master took the matter under advisement, and in June, 1925, advised the petitioners that after careful consideration, he had decided to grant their request. Notices were sent to all those who had signed the petition, to the members of the Boston University Square and Compass Club, and to the Masters and Wardens of the Lodges comprising the Second Masonic District, announcing that the institution of Boston University Lodge would take place on October 8, 1925, at 536 Massachusetts Avenue, Cambridge, Massachusetts. At eight o'clock on that evening, Right Worshipful Arthur Earl Fisk, being announced by Worshipful Edward F. Wallis, District Deputy Grand Marshal, entered the well-filled lodge room and assumed the East. After reading the dispensation, the officers were inducted into their respective stations and the Lodge and the dispensation were given into the charge of the Worshipful Master. Appropriate remarks were made by the following distinguished guests: R. W. Guy H. Holliday, Past District Deputy Grand Master for the Second Masonic District, Past Master of Joseph Webb Lodge and Past Master of The Harvard Lodge; Wor. Jess H. Jackson, presiding Master of The Harvard Lodge; Brother Francis L. Bain, Senior Warden of Amicable Lodge, the oldest Lodge in Cambridge (representing the Worshipful Master of that Lodge, who was ill); Worshipful George W. Ladd, Past Master of Mizpah Lodge and Senior Warden of United Lodge, at that time the youngest Lodge in Cambridge; Right Worshipful Frank L. Simpson, Past Deputy Grand Master and a Professor at Boston University Law School. The presiding Master of Richard C. Maclaurin Lodge, Worshipful Harry C. Bradley, was scheduled to speak, but being unable to be present, he sent a letter expressing his best wishes to the new Lodge. Following a year of successful operation, the ceremony of constitution of Boston University Lodge took place on September 29, 1926, at the same location, and was performed by Most Worshipful Frank L. Simpson, Grand Master of Masons in Massachusetts and a Charter Member of Boston University Lodge. The Master, Senior Warden, Junior Warden, Treasurer, Secretary and Chaplain were installed by the corresponding Grand Lodge Officers. The remaining officers were installed by Deputy Grand Master Herbert P. Bagley, and they were likewise seated by the corresponding Grand Lodge Officers. The Most Worshipful Grand Master then addressed the Lodge on the subject, "The Progress of Freemasonry in Massachusetts," after which he retired with his Suite. Boston University Lodge continued in Cambridge until February, 1929, when the location was changed to the Masonic Temple in Boston where the meetings are still held. Some effort has been made to find suitable quarters on or near the University Campus so that the Lodge might be closer to its members and be in a position to render more effective Masonic service. While nothing definite has been accomplished as yet, there are indications that the time is not too far away when this step can be realized. There has always been a cordial relationship among the three college Lodges of M. I. T., Harvard and B. U. The first concrete evidence of the raternal spirit was shown on Thursday evening, February 20, 1930, when The Harvard Lodge was host to Richard G. Maclaurin Lodge and Boston University Lodge at the Temple in Cambridge. After a fine dinner, the officers of the three Lodges joined in the work of the Master Mason Degree. This close association has continued down through the years, both in Masonic work and in social activities. The latest occasion was on October 25, 1950, when the three Lodges combined to confer the Master Mason Degree on Boston University's 25th anniversary class of candidates. The first class of candidates to be received, passed and raised in Boston University Lodge consisted of Alfred Leonidas Dion, Walter Clark James, Harris Lawrence Phillips, George Edwin Thompson and William George Hoffman. Brother Dion passed into the Great Beyond in 1931; Brothers Phillips and Hoffman have taken dimits. As of now, therefore, Brothers James and Thompson are the two senior members with respect of those who have taken their degrees in this Lodge. The former is the well-known Bursar of the University and Chairman of the Trustees of the Relief Fund. The latter served the Lodge as Master in 1933. During the first five years of its life, the Lodge steadily increased its membership from the original eighty-six to one hundred eight. The next ten years were difficult ones because of the general economic conditions and the number of applications received was small. The last ten years have been a resumption of growth until the membership is now one hundred thirty-seven. There are three elected candidates waiting to be received and at least three other applications to be acted upon. The largest number of candidates to be received in any one year was in 1947, during the administration of Worshipful Brother A. Roy Thompson, when eighteen men were obligated on the First Degree. One of the really outstanding events in the life of Boston University Lodge was the joint meeting of the three college Lodges held under special dispensation at Cambridge on January 16, 1941, when each station was occupied by an officer of each Lodge. There were three Masters presiding in the East, and as The Harvard Lodge was the host Lodge, Worshipful Carroll F. Getchell of that Lodge declared the three Lodges individually and severally opened. This was a noteworthy meeting as it was the first time since the constitution of Boston University Lodge that the East of our Lodge had been occupied by a presiding Grand Master. Among those present were four Past Grand Masters, the Deputy Grand Master and the Grand Marshal, the Senior and Junior Grand Wardens, the Grand Treasurer, Grand Secretary, District Deputy Grand Masters of the Boston and Cambridge Second Masonic Districts, as well as many other prominent Masons. Most Worshipful Albert A. Schaefer presided in the East, and addresses were made by M. W. Melvin M. Johnson, M. W. Arthur D. Prince, M. W. Herbert W. Dean, M. W. Claude L. Allen and R. W. Arthur W. Coolidge. There were present, including ladies, 250 persons, and after the meeting, there was dancing in the lower hall for those who wished to stay. This history would not be complete without recording the tribute paid by the Most Worshipful Grand Lodge to our Past Master, Worshipful (Major) Norman Brooks Morrison at its Quarterly Communication on March 10, 1943. Worshipful Brother Morrison had just returned from the Pacific Theatre of war and was on thirty day sick leave. It was arranged that he should attend the Quarterly Communication of the Grand Lodge and he was called upon to address the assembly. He was the first returned soldier of World War II to be so received and the entire gathering rose to acclaim him. Two members have brought particular honor to Boston University Lodge by having been appointed Grand Lodge Officers. Worshipful Osborne B. Tabor served as Junior Grand Steward in 1949 and Right Worshipful Norman M. Gay as District Deputy Grand Master in 1942 and 1943. It should also be noted that both of these Brothers have served the Lodge as Secretary, Right Worshipful Brother Gay having held that office for fifteen years, from 1932 through 1947. In the beginning, it was the energy and imagination of Brother Harold C. Spencer that made possible the birth of Boston University Lodge, and sad it is to record that because of his untimely death in January, 1926, he did not see the fruits of his labor. During the early years of the Lodge, it was the strong hand and wise counsel of Worshipful Brother Arthur W. Weysse that put the Lodge on a sound basis and it is greatly to be regretted that failing health has made necessary his withdrawal from active participation in its affairs. Down through the years it has been the devotion and self-sacrifice of many members that has kept the Lodge on an even keel and enabled it to make substantial progress. If the present and future officers will carry on in like manner, Boston University Lodge can safely be said to have before it a place of the highest esteem among the members of the Fraternity. From 1950 to 1976 by Right Worshipful Wyman S. Randall. "Time," a poet once said, "goes by turns", which is precisely the dictionary's definition of "anniversary". Boston University Lodge has completed fifty years of Masonic Brotherhood. "The stalwart builders of yesterday will not live again, nor will their deeds be reenacted on Time's stage." So said Most Worshipful Thomas Sherrard Roy in the epilogue of his book, "Stalwart Builders". Now, as this Lodge of Masons begins another era of fellowship and service to the Masonic Fraternity, we are aware of the firm foundation provided for us by those dedicated brethren who realized fully the value of the tenets of Freemasonry. We begin this sketch with a brief account of three significant events which marked the first quarter century observance. Boston University Lodge opened its twenty-fifth anniversary on Sunday, October 8, 1950, with a special service held in the Marsh Chapel on the campus of the University. Dr. Daniel L. Marsh, University President, presented the Lodge with a gavel made of stone from the same quarry which supplied materials for Solomon's Temple. This generous gift was accepted by Worshipful Brother Alden B. Ackerman, Master of the Lodge. Present at this impressive service were Deans and Trustees of the University, Most Worshipful Roger Keith, Grand Master of Masons in Massachusetts, representatives of the Richard C. Maclaurin Lodge of M. I. T. and The Harvard Lodge, as well as Masons of Lodges in Boston and Cambridge Districts. Reverend Brother Ralph Ernest Bayes gave the call to Worship and the Invocation. Reverend Brother Joseph N. Haskell, read the Scripture. Prayer was offered by Worshipful Reverend A. Roy Thompson. Worshipful Ackerman welcomed the illustrious gathering and introduced the speaker, Brother Dr. Daniel L. Marsh, President of Boston University, whose sermon was entitled: "The Mysterious Bond of Brotherhood". The closing prayer, pronounced by Brother Henry A. Wayringer, concluded the three o'clock service. Good fellowship followed at a reception and tea held in the Chapel Refectory. Then on Wednesday, October 25th, a Lodge meeting convened with an Anniversary Class of four: Brothers Charles Herbert Blanchard, Robert Assad Abodeely, George Elias Brikates, and Albert Spero Hayeck receiving the Master Mason Degree. Officers of the Academic Lodges participated in the work with the host Lodge. A reception for the 25th Anniversary Class was held following the closing of the Lodge. The third event occurred on Friday, October 27th, when Boston University Lodge opened at 5:30 P.M. with dinner served at 6:30 P.M. followed by a Smoker and Piano Recital. At eight o'clock, the Grand Master, Most Worshipful Roger Keith, was received. (1950 Mass. 130-137) Worshipful Brother George E. Thompson read the history of the Lodge as prepared by Worshipful Alden B. Ackerman. This portion of the program preceded an address delivered by the Grand Master. Several solos were capably rendered by Brother Henry Heald during the evening. A procession and recognition of the Charter Members and remarks by other distinguished guests followed previous to the closing of the Lodge and the Grand Lodge by the Grand Master. It was, indeed, an outstanding three fold series of impressive events marking the Quarter Century Anniversary of Boston University Lodge. As a prelude to the Anniversary, Masonic Night at the Boston Pops on May 25, 1950, was a social fraternal evening with Lodges in the Second Masonic District attending. A year later, the first Annual University Masons' Night was held in the Brighton Temple with Brother Dr. Daniel L. Marsh as the speaker. It was a customary "sodality", so called, that was held on the Wednesday preceding the fourth Friday of the month at 7:00 o'clock in Tuscan Hall. During the 1950's "rehearsal" became the term more familiarly designated and has been so stated since then. With the installation of Worshipful Brother David W. Calkins in 1950 the format of the Boston University Lodge Notice changed from the early customary 5Vi x 8l/2 arrangement of a single fold to a smaller three fold type size. During his term, some thought was considered as to a change in the Lodge meeting place. Consequently, several meetings during 1951 were held in the Brighton Temple giving the brethren the opportunity to view the Masonic apartments prior to voting our meetings there. A Past Masters' Night with all stations filled by Boston University Past Masters, and the first Brotherhood Night with a reception to Reverend Brother and Doctor Harold C. Case, President of Boston University, who delivered the evening's address. Professor Dr. Emory S. Bucke, Editor of Zions Herald, clergyman and member of Oxford Lodge was the speaker at the social hour. Even with these excellent programs a change to Brighton did not seem feasible. Even though the idea still lingered toward finding meeting quarters closer to the University as contemplated some twenty odd years earlier, such a change did not transpire and our Lodge meetings are still held at the Boston Temple. With the installation of Worshipful Brother David L. Pallian as Master, the Lodge Notice assumed the same size and type of the four-fold as at present. THE TRESTLEBOARD made its appearance with the February, 1952 notice. Worshipful Brother Pallian's first meeting, January 29, 1952, was "dedicated to honoring the Chancellor of Boston University, Dr. Daniel L. Marsh, with a conferral upon Dr. Marsh of Honorary Membership". The meeting was termed "Chancellor's Night" with a banquet at 6:30 P.M. followed by an inspiring address by Brother Marsh and greetings by distinguished guests. On January 24, 1952, "a Degree Team of Boston University Lodge made its first appearance in the Charles A. Welch Lodge before almost two hundred Masons. It received acclaim as having conferred the Third Degree with an excellence not paralleled in the memory of most of those present". The newly formed Degree Team conferred the Degree of Master Mason in long form on Brother Thomas John Thomas at a special communication, February 8, 1952. Brother Thomas was scheduled to leave for duty in the Armed Forces within the week. Worshipful Brother Pallian received many letters during that same year from Brothers of Boston University Lodge who were on active duty with the Armed Forces who expressed gratitude for the monthly Lodge Notices sent to them, giving them closer connections with their Lodge and a welcome bit of news from home. In response to numerous requests, the Program Committee arranged for a Masonic Breakfast and Chapel Service at Boston University. The breakfast in the Commons on Sunday morning, March 23, 1952, with Professor Dr. Emory S. Bucke as speaker proved to be a most gratifying experience. Dr. Bucke had been the speaker at the November Brotherhood Night. Bishop John W. Lord delivered the sermon in Marsh Chapel following the breakfast. This stimulating and impressive occasion with the Brethren and their families in attendance was repeated once again, April 26, 1953. Forty-two applicants joined the membership of our Lodge during Worshipful Brother Pallian's term of office, a number worthy of mention. A Letter to the Craft was begun during this same Master's term and continued for some months. 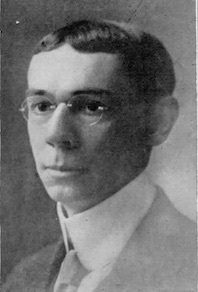 Brother John Thurber Coates was the first Editor carrying .on until he left Boston to pursue his journalistic career in Washington, D.C. Worshipful Brother Pallian next appointed Brother Sidney Allen Dimond, Professor at the School of Public Relations and a member of that same committee in Boston University Lodge as Editor, beginning, November of 1952. This "Letter" survived a short time but, nevertheless, it was a worthy undertaking during its well deserved existence. Worshipful Brother Pallian's service as Master was one of the most productive of any of the Master's terms. The annual Ladies' Night in May at the Faculty Club; Past Masters' Night that same month in Ionic Hall in the Temple followed the second annual Convocation of the Academic Lodges held in the Cambridge Temple, April 16, 1952 with Richard C. Maclaurin Lodge of M. I. T. as host. The main speaker that evening was Brother Ralph Lowell, trustee of Boston University, member of the Board of Overseers of Harvard University and a life member of the corporation of Massachusetts Institute of Technology. Well over two hundred attended the evening program as did the same number the previous Academic Lodge Night in 1951. On June 6, 1952, Boston University Lodge presented a ritualistic dramatization entitled "The Ancient Landmarks" which culminated after months of research and preparation. It was a premier performance insofar as could be ascertained, no program of this nature having ever been presented in this or any other Masonic jurisdication. In essence the performance, of one and one-half hours duration, exemplified the basic lessons of Freemasonry as contained in the three Degrees. The Grand Master, Most Worshipful Thomas Sherrard Roy, accepted an invitation to be present with the Master of every Lodge and Lodges of Instruction, including, also, the District Deputy Grand Masters. Sixty-five Lodges were represented with six Lodges of Instruction and three hundred fifty Masons were in attendance to view the performance held in Ionic Hall. Senior Warden, Brother Lou Callas' research, production and direction of the performance was especially noted by the Master. The team of performers were besieged with invitations to repeat the performance in other Lodges. It was performed before Temple Lodge, January 8, 1953; Adelphi Lodge and Fourth Lodge of Instruction, April 23 that same year; in Mount Sinai Lodge, Lynn, January 19; Brockton, April 16; and Salem Lodge, October 28, all in 1954. Following his installation as Master of the Lodge in 1953, Worshipful Brother Callas continued to direct the brilliant performance of this drama that he had skillfully written and produced. In 1954, he served the Lodge again as its Master, and in the years that followed his interest in the work of the Lodge continued until his untimely death on February 5, 1973. Worshipful Brother Callas will always be remembered for his significant leadership in the Lodge during its greatest period of growth and the scholarly contribution made to Masonic education. Sunday, November 9, 1952, marked the observance of the Two Hundredth Anniversary of Worshipful Brother George Washington's having been made a Mason. The Grand Lodge of Massachusetts commemorated this occasion with a parade and dramatic presentation in Mechanics Hall, then standing on Huntington Avenue in Boston. Members of Boston University Lodge participated in the parade and enjoyed the celebrated observance with all other Masons and guests who joined in the festivities. Faculty Night, January 23, 1953, Boston University Lodge welcomed those Masons on the University faculty and staff who were not members of the host Lodge. Brother and Dr. Daniel L. Marsh, Chancellor of the University and Honorary member of our Lodge gave one of his usual inspiring addresses following a catered dinner in the Boston Temple. During late 1952 and early 1953, sustained by the enthusiasm of Worshipful Brother Pallian, some thought and discussion was brought about as to how Boston University might best assist in the proposed organization of a DeMolay Chapter at the University should sufficient interest be evidenced by the students, with Boston University Lodge as the sponsoring body. To further stimulate interest among members of our Lodge in this organizational idea, it was arranged that on February 27, 1953, the exemplification of the DeMolay Degree by the newly constituted M. I. T. Chapter would provide a program on that meeting night. Students at the University who were members of DeMolay were invited guests. Brother Williard P. Lombard, a trustee of Boston University and in charge of DeMolay activities in Massachusetts was the speaker. The suggestion for the program and the exemplification proved to be of interest to the Lodge members. On March 17th, the next year, Boston University Chapter, Order of DeMolay, exemplified its "Initiatory Degree". Brother Lloyd Peterson, as Dad Advisor, assisted with the organizing of the Chapter with several Boston University Lodge brethren serving on the Advisory Council. Our Lodge was pleased to sponsor this young Chapter and to have been able to witness the degree work. The Most Worshipful Joseph Earl Perry Night, October 14, 1953 was an outstanding tribute to this Grand Master of the Grand Lodge of Massachusetts. Most Worshipful Claude L. Allen contributed greatly to the memorable occasion giving sketches of Grand Master Perry's service to Masonry with a number of members of Boston University Lodge, as well as brethren from other Lodges, adding their tributes of commendation to the honored guest, making it a most noteworthy evening. When the Lodge met on November 13, 1953, Right Worshipful Cecil R. Crissey, Treasurer of the Lodge, directed a "Table Lodge" at a special Lodge meeting. The guest of the evening, Right Worshipful Frank B. Crandall, had found the entire ritual for this presentation written in French among the records of Grand Lodge. Brother Crandall translated it and put it in due form. For many years, this "ancient " type of meeting had been lost to the Fraternity. Since this ritual was received with such high favor on this first occasion, it was repeated at the January 7, 1955, regular Lodge meeting. Most Worshipful Whitfield W. Johnson's term as Grand Master began most auspiciously when, on February 26, 1954, he held a special communication of the Grand Lodge in the Boston Temple, when he with his Grand Lodge Officers gathered for the purpose of receiving Most Worshipful Gilberto Morey Soto-Mayor, Grand Master of Gran Logia Del Peru, with headquarters in Lima. Boston University Lodge had a singular honor bestowed upon it by the Grand Master of Massachusetts, when Most Worshipful Brother Johnson selected our Lodge for a reception in honor of Most Worshipful Brother Soto-Mayor, a most significant event in the annals of our Lodge. After attending the Conference of Grand Masters in Washington, D.C., the Grand Master of Peru had come to Boston to visit the various surgical centers. He was particularly attracted to the Children's Hospital since he was chief surgeon in a Children's Hospital in Lima, Peru. Our Lodge was the host on June 11, 1954, for the Fourth Annual Convocation of the Academic Lodges. Worshipful Vannevar Bush, Past Master of Richard C. Maclaurin (M. I. T.) Lodge and President of Carnegie Foundation was guest speaker. That same evening, "The Ancient Landmarks" was exemplified by members of Boston University Lodge for the brethren of the guest Lodges. Since Boston University Lodge had had a degree performed by the Order of DeMolay, it seemed fitting that on March 25, 1955, Needham Assembly No. 57, Order of Rainbow for Girls should exemplify its work by conferring the initiatory degree on five of their candidates, with about seventy members of the Assembly assisting. This was the first appearance of the Rainbow Order before our Lodge. April 22, 1955, was designated as "University Night" to honor all Masons who were employed at Boston University. The main speaker was Reverend Brother and Dr. Harold C. Case, President of the University, who was introduced by Most Worshipful Joseph E. Perry, Treasurer of the University and a Past Grand Master of Grand Lodge and an Honorary Member of Boston University Lodge. It was a rewarding evening with about seventy-five present including many of the University faculty and administrative personnel. The year 1958 was marked by the Two Hundred Twenty-Fifth Anniversary of the Grand Lodge of Masons in Massachusetts. This event was celebrated at the Stated Communication of the Grand Lodge with Installation of Officers and the observance of the Feast of Saint John the Evangelist on December 29. The publisher of the "Masonic Craftsman" prepared a special anniversary number to commemorate the occasion. A play entitled, "In the Beginning", depicting the founding of the Grand Lodge was performed in John Hancock Hall on Saturday, December 27th. The next day, on Sunday afternoon, a commemorative service was held at the Arlington Street Church with Reverend Brother and Bishop John Wesley Lord as the principal speaker. He substituted for Bishop G. Bromley Oxnam, who had suffered an unfortunate injury. The installation of the Grand Lodge Officers and the annual Feast of Saint John combined to make Monday a fitting climax for this Anniversary celebration. The theme of the observance centered upon the subject, "Freemasonry in Our Rapidly Changing Society". Here it might be noted that in September of 1958 Boston University Order of DeMolay purchased a five story apartment house at 197 Bay State Road. This, supposedly, was the first DeMolay building of its kind. Our Lodge shared in the interest concerning this undertaking since the Lodge continued to be sponsor of this DeMolay Chapter. An outstanding event was held April 24, 1959, when Boston University Lodge honored one of its prominent and active charter members and a distinguished Mason, Right Worshipful Norman M. Gay on his special night. The affair took place in the auditorium of Boston University School of Fine and Applied Arts on Commonwealth Avenue. A reception for invited guests preceded a buffet supper, followed by entertainment featuring a concert by the Boston University Marching Band with guest soloists. Reverend Brother and Dr. Harold C. Case, President of the University, provided a most gratifying and inspiring climax. This was an evening befitting one of our Lodge brethren who has continually served his Lodge and all Masonic bodies with great loyalty. The climax of the evening was the presentation of the first "Boston University Lodge Mason of the Year" Paul Revere Bowl. The 337th Regular Communication, June 26, 1959, was specifically termed as "Distinguished Masons' Night". A team of eminent Masons, under the guiding hand of Right Worshipful S. Kenneth Skolfield, then Secretary of our Lodge, worked the Second and Third sections of the Master Mason Degree with his son, Brother Frederick Cabot Skolfield as the candidate. Among those working the Degree were: Right Worshipful Alden B. Ackerman, Senior Warden; Right Worshipful Herbert H. Jaynes, Past Senior Grand Warden as Junior Warden; Worshipful George A. Weeks, Grand Recorder, Grand Commandery Knights Templars as Treasurer; Right Worshipful Norman M. Gay as Secretary; Reverend Brother G. Vaughan Shedd, Chaplain; Right Worshipful Laurence E. Eaton, Past Senior Grand Warden as Marshal; Right Worshipful William F. Clark, Grand Secretary, Grand Chapter, as Senior Deacon ; Right Worshipful Robert T. Westermark, Junior Deacon; Right Worshipful A. Neill Osgood, Past Deputy Grand Master as Senior Steward; Right Worshipful Frederic L. Pike, Grand Secretary, Scottish Rite as Junior Steward; Worshipful Frank A. MacKay, Inside Sentinel; Right Worshipful William H. Haugh, South Gate; Worshipful John Reid, West Gate; Right Worshipful Cecil R. Crissey, East Gate. Reverend Brother John Wesley Lord, resident Bishop of the Methodist Church and Past Grand Chaplain gave the Charge to the candidate. The Masonic Message was delivered by Most Worshipful Whitfield W. Johnson, Past Grand Master of Masons in Massachusetts. Right Worshipful George Franklin, District Deputy Grand Master, Boston Second and Right Worshipful Lorenzo B. Carr, District Deputy Grand Master, Cambridge Second accompanied by their officers and suite paid a Fraternal Visit. Other distinguished Masons who were invited to take part in the work of the evening included: M. E. Eugene P. Carver, Jr., Grand High Priest, Grand Royal Arch Chapter; M. I. James C. Bayley, Grand Master, Grand Council Royal and Select Masters; R. E. Sir Alfred C. Blake, Grand Commander, Grand Commandery, Knights Templars; Ill. Donald W. Vose, Commander-in-Chief, Massachusetts Consistory; Brother Dr. Daniel L. Marsh, Chancellor of Boston University; Right Worshipful Charles H. Sargent, Jr., Relief Commissioner of the Grand Lodge; Right Worshipful Norman A. Ray, P. S. G. W., Director of Education of the Grand Lodge; Right Worshipful Roger A. Vint, Grand Representative of Grand Lodge. This was undeniably an evening of significant remembrance in the annals of Boston University Lodge. Another evening of distinction in the history of our Lodge occurred on February 26, 1960, when Most Worshipful Laurence E. Eaton, Grand Master of Masons in Massachusetts, scheduled a Special Communication with Boston University Lodge for the purpose of receiving Most Worshipful C. M. R. Davidson, Grand Master of Masons in The Netherlands, and Right Worshipful Dr. Peter J. VanLoo, Grand Secretary. It was also the planned Past Masters' Night with Right Worshipful Brother Alden B. Ackerman serving as Chairman. The 345th Regular Communication of Boston University Lodge and the Tenth Annual Convocation of Academic Lodges was held in Ionic Hall, Boston Masonic Temple, on Friday, April 22, 1960. The officers of the three Lodges participated in the work of the evening when five Boston University candidates received the Fellow Craft Degree. Most Worshipful Whitfield W. Johnson, Past Grand Master of Masons in Massachusetts and a Past Master of The Harvard Lodge was the speaker. The evening also marked another auspicious event when our Lodge awarded the Boston University Lodge "Mason of the Year" to Lodge Secretary, Right Worshipful S. Kenneth Skolfield, a prominent Mason who served the Lodge with great distinction. He was presented the customary Paul Revere Bowl from Boston University Lodge in recognition of his services and devotion to the Lodge. To add to the fine evening, Most Worshipful Brother Johnson gave an instructive and illuminating talk on the beginnings of the three Academic Lodges and the extent of their jurisdiction. At the "Past and Presiding Masters' Night", in 1961, Right Worshipful Alden B. Ackerman was awarded the Boston University Lodge "Mason of the Year". Brother Ackerman's accomplishments, honors and services which had proven to be so constructive for the Lodge were, indeed, noteworthy. He was Master in 1950 at the time of the Twenty-fifth Anniversary when he wrote the First Quarter Century History. He served as Secretary in 1951; Senior Grand Steward in 1952; Proxy to the Grand Lodge from 1959 to 1968; District Deputy Grand Master of Boston Second in 1955-56; Trustee of the Permanent Fund until 1955, then re-elected to 1958; a member and chairman of several committees over the years. A most enviable record of a loyal Mason. Each year, usually in February or April, the Faculty Degree Team performed its work with perfection on Boston University Night. Ladies' Night is customarily an event of yearly prominence with other fine occasions scheduled to draw attendance among the membership. A number of Masters of our Lodge have tried to stimulate interest in this manner by providing short programs. However, this has not been sufficiently carried through to attain its objective. Our Lodge has, on many occasions, joined with other Lodges in the Boston Second Masonic District for the annual visitation to the then Masonic Hospital at Shrewsbury and to the Masonic Home at Charlton where family picnics were enjoyed followed by lively entertainment arranged for the visiting Masons and their families. Some years, the Masonic Districts contributed money for a monetary gift to give to each guest at the Home with small poinsettia plants for all patients at the Hospital. This Christmas cheer was always greatly appreciated and many were the letters received by the District Deputy Grand Masters expressing the individual's gratitude. There were a few years (1957 for one) when financial support was requested from the Brethren by the Master of the Lodge so that equipment could be purchased for the Masonic Home in unison with the other Lodges of the Boston Masonic District. With the advent of television and the introduction of this latest invention for family home pleasure, attendance at Lodge meetings began to fall off. Boston University Lodge was no exception, for the desire to watch programs on "the TV screen" kept members at home. All organizations suffered because of this new invention. By 1955-56, our Lodge felt the impact with fewer members thereafter attending Lodge meetings. Up until the year 1953, it had been the custom of the Lodge to elect its officers at the annual communication in December with installation taking place in January. That year of 1953, however, officers were elected in .March with installation, April 11th. Consideration was then given to changing the election to June with installation taking place in September. Nevertheless, it was not until 1954 that the change was definitely made. Since that year, each election takes place in June with a September installation of officers. The officers and those newly-elected and appointed, clothed in the red robes exemplifying the colors of Boston University, has always been a stimulating and inspiring sight and lends a notable degree of association with the University within whose hallowed halls our Lodge was instituted. At the June 22, 1951 regular meeting, action was taken relative to raising the customary $10.00 annual dues to $12.00 to become the procedure for that ensuing year, June, 1967 another raise became effective with an increase of $5.00, to be raised once again to $20.00 in 1971, commencing September of that same year. An exceptional honor was bestowed on our Past Master, Right Worshipful Norman M. Gay on December 9, 1964, when he was appointed Deputy Grand Master of the Grand Lodge by Most Worshipful A. Neill Osgood, Grand Master of Masons in Massachusetts. Boston University Lodge shared in that distinction with a reception to Right Worshipful Brother Gay on March 26, 1965. Following a dinner in the banquet hall, presiding Master, Worshipful Edward M. Goldstein, with Officers of the Lodge convened in Ionic Hall to receive Most Worshipful A. Neill Osgood and a large suite of Grand Lodge Officers and many distinguished guests. During the program that followed, Most Worshipful Brother Osgood presented Right Worshipful Brother Gay with the coveted Henry Price Medal and Worshipful Brother Goldstein presented a Deputy Grand Master's Jewel to Brother Gay on behalf of the Lodge. Many Past Masters of the Lodge and nine Charter Members were present together with a fine showing of Lodge members to pay honor to Brother Gay as its Senior Past Master and newly installed Deputy Grand Master. In 1963-64, Worshipful Wyman S. Randall instituted a series of short talks which he delivered at Lodge meetings on the subject, "Pathways to Masonic Knowledge", designed to strengthen and increase the members' knowledge regarding Masonry's Symbols, history, and every day usage in accordance with their significance and application to present day life. Short programs of interest sparked the Lodge meetings. During his term, as one of his specific projects, Brother Randall listed .Masonic Birthdays of the Brethren each month, priming them in the communication notice to acknowledge personal recognition and remembrance. A total of 254 members were recognized on their Masonic Birthday month. The April 24, 1964 meeting was highlighted by a concert given by the Boston University Brass Choir, conducted by Mr. Dean Farnham, Doctoral Teaching Fellow at the University with fourteen musicians from the student body selected to participate. This well performed program, held in Ionic Hall, was arranged by Brothers Lee Chrisman and Alan B. Sostek. Both brethren were members of the faculty at the University. "Past Masters' Night" on May 25, 1964, was also a Fraternal Visitation by Right Worshipful Eugene C. Blanchard and his suite of Masters and Wardens of the Boston Second Masonic District. The June, 1965 meeting was highlighted when Right Worshipful Brother Blanchard, District Deputy Grand Master presented Right Worshipful Alden B. Ackerman the Joseph Warren Distinguished Service Medal for outstanding service to the Lodge. At the June, 1968 Communication of the Grand Lodge, Most W7orshipful Thomas A. Booth presented this same prized Joseph Warren Medal to Brother Robert Gladwin in commendation and recognition of special services performed for Grand Lodge in matters pertaining to the Commonwealth of Massachusetts. At the 402nd Regular Communication of January 28, 1966, presiding Master Worshipful Irwin R. Macey was obliged to cancel the meeting by "reason of hazard" as indicated in the Lodge records. This was due to the severe and tragic explosion resulting in a disastrous fire that occurred in a building near the Boston Temple on Boylston Street. All water and electricity were temporarily shut off at the Temple due to the explosion, which certainly contributed to a "hazard". As far as we can determine this is the only time the Lodge meeting had to be cancelled for such a catastrophe. The following month, the Lodge was able to resume as usual. It was at the February 24, 1967 meeting that the Lodge was able to welcome a new member who would later serve as the Lodge Chaplain. Brother and Reverend Leicester R. Potter was raised to the Sublime Degree of Master Mason by an eminent Clergy Degree Team presided over by Right Worshipful and Reverend Robert M. Clogston, District Deputy Grand Master of the 13th Masonic District and Past Master and Chaplain of Hope Lodge of Gardner. Brother Potter had been recommended to the Lodge by Right Worshipful S. Kenneth Skolfield and Right Worshipful Cecil R. Crissey knowing Brother Potter to be a Hospital Chaplain at the University Hospital. This led five years later, on December 20, 1972 to the raising of Rabbi Israel David Oler in our Lodge. Rabbi Oler was serving with Brother Potter as a Chaplain at the University Hospital and he later became our Associate Chaplain. April 17, 1968, "Past Masters' Night", was held with all stations, excepting that of organist, filled by Boston University Lodge Past Masters, conferring the Master Mason Degree with fifteen Past Masters participating in the meeting held in Tuscan Hall, making it a most impressive occasion. 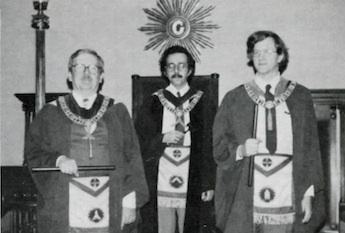 May 21, 1968, the annual Exemplification of Lodges in the Boston Second Masonic District was held in the Cambridge Temple, with Past Master of our Lodge and presiding District Deputy Grand Master, Right Worshipful Wyman S. Randall providing leadership for the occasion. Then on June 21st, that same year, Brother Randall was honored by being inrtailed as Master of the 7th Lodge of Instruction at the same Temple. Two other Past Masters of our Lodge have served as Master of the 7th Lodge of Instruction. These are Worshipful Hurlburt L. Plummer in 1937-38 and R;ght Worshipful Alden B. Ackerman in 1955-57. Grand Lodge undertook extensive alterations to the Boston Temple both on the exterior, near and at the corner of Tremont and Boylston Streets and on the interior of the ground floor. April 19, 1967, ceremonies were held to dedicate Paul Revere Hall. Because of limited space, invitations were issued by Most Worshipful Thomas A. Booth to just the Past Grand Masters, Grand Lodge Line Officers, District Deputy Grand Masters, Permanent Members of the Grand Lodge and to official guests. The lobby and exterior of the building, where shops had formally existed, were renovated and modernized to add greater beauty and convenience to the Temple. The exterior Mosaic Panels which beautify and adorn the Temple wall exemplify dedicated Masonic craftsmanship with significant Masonic symbols. The 440th Regular Communication of Boston University Lodge was held in Tuscan Hall on November 19, 1969, with a business meeting and conferral of the first section of the Third Degree. After the Lodge had recessed for dinner, the Secretary's record indicated it was "reconvened at 8:00 o'clock with an official visitation by Right Worshipful Wymari S. Randall and his distinguished Suite, the largest in the history of Boston University Lodge". Because of the size of the suite, the Lodge was obliged to move to Gothic Hall to accommodate the reception. Worshipful Wesley Wu, Master of Boston University Lodge, presented Right Worshipful Brother Randall with a large Paul Revere bowl, suitably inscribed to honor his selection as Boston University Lodge "Mason of the Year", a distinction held by only three other Lodge members. In making the presentation, Worshipful Wu stated, "this is an honor bestowed upon a man who has contributed much to his own Lodge, but has brought far greater honor to all of us at Boston University by his outstanding contributions to the entire Craft. We at Boston University Lodge are signally proud and pleased to make this presentation to so distinguished and exemplary a man and Mason". Most Worshipful Whitfield W. Johnson, Past Grand Master, also spoke and "in a few well chosen words, as was his custom, he adequately summed up the feelings of the large throng present to honor this dedicated man," as so noted in the Secretary's record. Continuing his interest in Masonic Education, Right Worshipful Brother Randall was appointed Director of Education of Grand Lodge by Most Worshipful Herbert H. Jaynes on June 10, 1970, and he continues to serve in this office as this history is being written. A Table Lodge, presided over by Worshipful M. Lee Chrisman was performed on January 20, 1971 in a joint communication with Euclid Lodge following conferral of the Entered Apprentice Degree on two Boston University candidates and the Fellow Craft Degree on a Euclid Lodge candidate. "Salute to Charter Members' Night", April 21, 1971, was of great interest with five charter members recognized that evening. These early Masons included: Brother Maurice E. Andelman, Right Worshipful Norman M. Gay, Brother Reuben Hall, Brother Atlee L. Percy and Brother Rufus Stickney. A fifty year Veteran's Medal was presented to Worshipful George R.S. vonKapff, who served as Master in 1942. It was noted in the records by Lodge Secretary Worshipful George F. Ramacorti that "45 years ago Boston University Lodge was constituted with 79 Charter Members and only the five listed above are currently members". An Entered Apprentice Degree was worked on one candidate and a Fraternal Visitation was made by Right Worshipful Harold J. Kaswell, District Deputy Grand Master, Boston Second Masonic District. On May 5, 1971 our Brother Gregary B. Khachadoorian was the recipient of a significant award given by the Massachusetts Society for the Prevention of Blindness, Inc. As a member of the Massachusetts Legislature, Brother "Greg" filed the first bills in the United States for safer lenses and safer frames. It was in June 1970 that Massachusetts passed the first complete Model Eyeglass law in the United States, resulting largely through Brother Khachadoorian's legislative efforts. His Citation by the Society named "Greg" for "his extraordinary achievements in Prevention of Blindness." The establishment of a Boston University Masonic Lodge Scholarship Fund began to be considered by a few members of the Lodge. At the May 17, 1972 meeting, a proposed amendment to the Lodge By-Laws under Article VIII and IX pertaining to "Funds of the Lodge" was announced. The amendment was "to establish a Scholarship Fund under the management and care of the Board of Trustees." The purpose of the Scholarship was "to make awards, applicable to tuition charges at Boston University to those persons whose eligibility and qualifications had been certified and recommended by the Scholarship Committee". 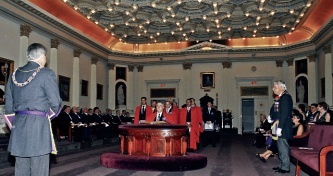 The proposed By-Law revision was voted upon at the June 21, 1972 meeting; subsequently revised with further discussion until the final draft was offered to the Grand Lodge for its verification by the Committee on Charters and By-Laws. This was a necessary procedure for the implementation of the Scholarship program so it could get underway. It was hoped by the presiding Master, Worshipful M. Lee Chrisman, that the first scholarship could be presented in 1975 on the occasion of the Fiftieth Anniversary of Boston University Lodge, thus making it possible to grant financial aid to a Mason or a member of his family during that specific year; with tuition provided at any of the sixteen schools under the University Program. It was announced at the November 21, 1973 Lodge meeting that since our Lodge had been granted approval by the Grand Lodge, a Boston University Masonic Scholarship Fund would become a reality. At the Installation of Officers on September 20, 1972, Master-elect Norman H. Finkelstein was installed Worshipful Master. Among the visitors there was noted a fine ecumenical significance with the presence of officers and their ladies from Pere Marquette Council, Knights of Columbus in South Boston and two Parish Priests of the Boston Archdiocese. The November 15, 1972 Boston University Lodge notice contained a message from the Grand Master, Most Worshipful Donald W. Vose, explaining the stand of Grand Lodge concerning the Order of Rainbow for Girls which, because of the Supreme Assembly restriction, prohibited black girls from membership in that Order. The message stated that the Grand Lodge of Massachusetts opposed such restrictive acts of discrimination that affected race, color or creed, as being contrary to Masonic teachings. It was in 1973 that a state-wide program was announced with an objective of the Massachusetts Grand Lodge to raise two million dollars for the modernization of the Masonic Home in Charlton with consolidation of the Shrewsbury Nursing Home transferred to Charlton. At the December 19th meeting of the Lodge that year, Right Worshipful Wyman S. Randall was named chairman of the Masonic Home Expansion Program for the Lodge by Worshipful James A. Wiltshire, then Master. The annual Academic Lodge Convocation, held on March 21, 1973 had Boston University Lodge serving as host. Presiding Masters of Richard C. Maclaurin (M.l.T.) Lodge, The Harvard Lodge and Boston University Lodge participated in the Entered Apprentice Degree conferred on a candidate from the M. l. T. Lodge, followed by a dinner and a Fraternal Visitation by Right Worshipful James E. Cushing, District Deputy Grand Master of the Cambridge Second Masonic District. These convocations have proved always to be a means of strengthening the bonds of fraternal friendship with our academic brethren. On March 18, 1973, our Chaplain Reverend Brother Leicester Potter realized the accomplishment of an "impossible dream" that had been in mind for twenty-eight years. This "dream" was the dedication of an Interfaith Chapel at the University Hospital. When Brother Potter began his work as Chaplain at the Hospital in 1944, he said he had "planned to stay five years, build a chapel and leave". But he had stayed for twenty-eight years and now the Chapel had become a reality. Taking part in the dedication service with others was Rabbi Brother I. David Oler, also a member of Boston University Lodge and our Associate Chaplain. This association of these two brethren has continued both at the Hospital and in our Lodge. Fifty Year Veteran's Medals and Pins: Brother Rufus Stickney, Brother Maurice Andelman, Right Worshipful Alden B. Ackerman. Forty-five Year Pins: Brother Allan S. Taylor, Worshipful Everett B. Dewar, Brother Franklin C. Erickson, Worshipful Homans S. Foster. Thirty-five Year Pins: Worshipful Osborne B. Tabor, Brother Robert B. Spilman, Brother Leonard W. Taylor, Worshipful Ralph E. Mills, Brother Michael N. Abodeely. Twenty-five Year Pins: Brother Robert Gladwin, Right Worshipful Wyman S. Randall, Brother Charles J. Reilly, Brother Chester M. Alter, Brother Leslie D. D. Stark, Brother Norman Abbott. In November of 1974 the Lodge learned that one of its Past Masters had been chosen to serve as Chairman of the Grand Lodge Bicentennial Committee. Most Worshipful Donald W. Vose had appointed Right Worshipful Wyman S. Randall to carry on the work that had been so well initiated by Most Worshipful Laurence E. Eaton and his Committee. With this appointment a Committee of eighteen that included Most Worshipful Stanley F. Maxwell, Grand Master, two Past Grand Masters, Grand Lodge Officers, and Past Masters of Lodges throughout the Commonwealth, there followed an extensive program in 1975 by re-enacting and commemorating Revolutionary events in which Masonic Patriots took a commanding part. The meeting notice of January 15, 1975, contained a congratulatory message by presiding Master Worshipful Irwin R. Macey on the election of our brother Right Worshipful Wyman S. Randall to the office of Junior Grand Warden for 1975, and stated "this not only reflects great credit upon Brother Randall, but upon our Lodge as well". The election took place at the Regular Quarterly Communication of Grand Lodge on December 11, 1974 with Installation on December 27, that year. A reception was given to our newly installed Junior Grand Warden on the evening of March 20, 1975 by Euclid Lodge. This was held in Ionic Hall of the Boston Temple, following a dinner in the banquet hall. An impressive suite of Grand Lodge Officers accompanied Most Worshipful Stanley F. Maxwell, Grand Master of Masons in Massachusetts and the nine living Past Grand Masters. Among the two hundred in attendance in Ionic Hall were members of the Education Committee of Grand Lodge and Past District Deputy Grand Masters of both the Boston Second and Cambridge Second Masonic Districts. Most Worshipful Stanley F. Maxwell presented the Henry Price Medal to Right Worshipful Brother Randall, the highest honor that is bestowed upon a member of the Grand Lodge of Massachusetts. Right Worshipful Norman M. Gay, Past Master of Boston University Lodge and Past Deputy Grand Master of Grand Lodge presented the Junior Grand Warden's Jewel to Brother Randall. In September 1975, the Lodge lost through death one of its greatly respected and admired Past Masters. Right Worshipful Alden B. Ackerman passed away on September 11th. Brother Ackerman had been presiding Master of the Lodge on the occasion of its Twenty-fifth Anniversary hi 1950. He had hoped his health would permit him to join in the Fiftieth Anniversary services, but it was not to be. Presiding Master, Worshipful Peter S. Moore wrote in the Memoriam for Brother Ackerman, "We must at Boston University Lodge mourn his loss and shall honor his memory." By a vote of the Lodge it was decided to hold a special service on Sunday, November 9, 1975 to commemorate the Fiftieth Anniversary of the Institution of the Lodge that occurred on October 8, 1925. This service was held at 3:00 P.M. in the Daniel L. Marsh Chapel, University Campus, and we were signally honored with the presence of Most Worshipful Stanley F. Maxwell, and a distinguished suite of Grand Ixidge Officers, which included Most Worshipful Joseph Earl Perry, Senior Past Grand Master and an Honorary Member of Boston University Lodge. Most Worshipful Brother Maxwell expressed the greetings and best wishes of Grand Lodge to our Lodge. Assisting in the service were our Chaplains, Reverend Brother Leicester R. Potter, Jr., and Reverend Brother I. David Oler. The main address was given by our Past Master, Worshipful and Dr. Ernest H. Blaustein, Professor on the Boston University faculty. The title of Brother Blaustein's address was "Freemasonry and the University". It was an eloquent address and reminiscent of a similar inspiring message delivered by Brother Daniel L. Marsh, President of the University at the Twenty-fifth Anniversary in 1950. It was therefore a fine compliment to Brother Blaustein when Worshipful Peter S. Moore stated in his Trestleboard of November 19, 1975 "We are all grateful to our Brother Blaustein for a stirring and thought provoking message on this memorable occasion". Following the service a reception was held at "The Castle" on Campus attended by a large gathering. The 501st Regular Communication of the Lodge held on Wednesday, December 17, 1975 recorded the attendance of Right Worshipful Norman M. Gay. This was made significant and historic by the fact that he had been present at the First Communication of the Lodge and now fifty years and 500 Communications later, was able to be present again. Brother Gay's presence was roundly applauded. A "Night at the Opera" on January 24, 1976, at the Boston Conservatory of Music was a social event made possible by presiding Master, Worshipful Peter S. Moore and Past Master, Worshipful James A. Wiltshire. The program consisted of three, one-act American Operas, followed by a social hour at the Conservatory. On February 7, 1976, the Lodge mourned the sudden death of Worshipful George F. Ramacorti, Past Master and Secretary of the Lodge. The "In Memoriam" in the March 17th meeting notice paid tribute to Brother Ramacorti as "a selfless and giving Brother . . . and a leader in Church and Community affairs. His mark has been a good and lasting one." Worshipful George will be greatly missed within our Brotherhood. A Bicentennial Tour to Lexington and Concord historic spots for members and friends was conducted by the Lodge on June 5th. This included a visit to the Scottish Rite Museum of .our National Heritage and dinner at a local restaurant. Since the Constitution of our Lodge in September, 1926, there have been 556 Brethren who have signed our By-Laws and we now have a membership of 200. Among the "Coming Events" listed in the meeting notice of June 16, 1976, was the announcement of the Fiftieth Anniversary to be held at the Boston Temple on September 15, 1976, commemorating the Constitution of our Lodge on September 29, 1926. Most Worshipful Stanley F. Maxwell, Grand Master of Masons in Massachusetts, with a suite of Grand Lodge Officers are expected to be present at this Anniversary celebration. We are assured that "each succeeding anniversary becomes a legendary resume of the years that have faded into the dim past". The future waits to be freshly written with resolute dedication. And now, the third quarter century is before us with its challenges, concerns, and opportunities for beneficial achievements for Boston University Lodge and for the Grand Lodge in which we share and to which we owe our existence. It has been said that "Aspiration shows us the goal and the distance to it; Inspiration encourages us with a view to how far we have come." New opportunities will present themselves to make the future of Boston University Lodge more relevant to the complexities of the world of today and tomorrow. We owe it to ourselves to have pride in our past and faith in our future. For without such pride, such faith, we will have no future. Let us increase that pride and enlarge our faith to envision the great potentials worthy of the years yet ahead of Boston University Lodge as we strive to exemplify the high principles with constant loyalty to the Ancient Landmarks of the Craft and its fraternal growth in the tenets of Masonic Brotherhood. One of the outstanding events of the season, Masonieally, was the constitution of Boston University Lodge, A. F. & A. M., on the evening of September 29, by Most Worshipful Frank L. Simpson, assisted by officers of the Grand Lodge, in the presence of a large and distinguished body of Masons. The ceremany was preceded by a banquet in the dining hall, connected with the lodge room at 536 Massachusetts Avenue, Cambridge, in the section of the city generally known as Central Square. Most Worshipful Dudley Hays Ferrell, Past Grand Master of Massachusetts, was the after-dinner speaker, and congratulatory remarks were made by a number of the officials present. The officers of Boston University Lodge at its Constitution were: Worshipful Master, Arthur W. Weysse, dean of the graduate school; Senior Warden, Ernest W. Lord, '00, dean of the College of Business Administration; Junior Warden, Charles V. Briggs, graduate school; Treasurer, Ralph E. Brown, comptroller of the University; Secretary, Edgar R. Laconture, '18; Chaplain, Daniel L. Marsh, '18, president; Marshal, George E. Thompson, '24; Senior Deacon, Harry E. Cryan, '17; Junior Deacon, Wilbert G. A. Lindquist, '15; Senior Steward, Norman M. Gay, '25; Junior Steward, Ralph E. Evans, '22; Inside Sentinel, Wentworth Williams, instructor; Organist, Alfred L. Dion, '24; Tyler, Albert E. Kingsley, superintendent. The ceremonies attending the Constitution of the 300th lodge in Massachusetts were performed by Grand Master Simpson and his suite in a most impressive manner. After the Constitution of the lodge, Dr. Daniel L. Marsh, president of Boston University, gave an address on "Symbolism in Masonry." Boston University Lodge has been most warmly welcomed into the Craft by the Cambridge lodges, which are a part of the Second District. Amicable Lodge, which is the oldest of the lodges in Cambridge, being instituted in 1805, presented the new lodge with a beautiful set of great lights; United Lodge gave a handsome silk flag; the two other college lodges, as well as several others made presents of articles of regalia. A notable gift was a set of sterling silver working tools by the treasurer of Boston University, Brother E. Ray Speare, a charter member of the lodge. Dean Arthur W. Weysse, W. M.
Boston University Lodge starts out with 84 charter members. It is safe to say that no lodge ever started with a more prominent set of members. On the roster are Past Grand Master Melvin M. Johnson, eminent jurist and also a professor in Boston University School of Law; President Daniel L. Marsh, a member of Doric Lodge of Pennsylvania; Grand Master Frank L. Simpson, also a professor in the Law School; E. Ray Speare, treasurer of the University; Dr. William E. Chenery, a trustee of B. U., also a member of the faculty of Tufts College; Dr. J. Emmons Briggs, one of the trustees and professor of surgery in the School of Medicine; Graydon Stetson, a trustee of B. U. and the president of a bank; Dean Arthur W. Weysse of the Graduate School; Dean Everett W. Lord of the College of Business Administration; Assistant Dean Roy Davis of the C. B. A.; Dean T. Lawrence Davis of the College of Practical Arts and Letters. Dean Weysse is a charter member and Past Master of Richard C. MacLaurin Lodge; a charter member and marshal of The Harvard Lodge and a charter member and the Worshipful Master of Boston University Lodge. At tlie first regular meeting of the lodge after its constitution, held October 14, Right Worshipful Edward Frank Wallis, District Deputy for the Second Masonic District, paid his official visit, and was accompanied by a large suite of distinguished Masons. Among them was Right Worshipful Frank Vogel, past Deputy Grand Master for the Grand Lodge of Massachusetts, who was founder of Richard C. MacLaurin Lodge at the Massachusetts Institute of Technology. Like most good things in life, Boston University Lodge started from an idea. Richard C. MacLaurin Lodge, which was constituted in 1920, was the first collegiate lodge of Masons in the country. While an innovation in Masonry, it proved to be a wise step, and two years the Harvard Lodge came into existence. Soon thereafter a lodge was formed in the University of California. Its membership is limited to students of that institution. In 1909 the Masons in Boston University formed a Masonic Club now called Boston University Square and Compass Club. It is a member of the National League of Masonic Clubs. Two years ago a movement started for a Masonic Lodge in the University. 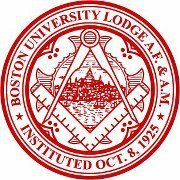 In 1925 a petition was presented by the Grand Master with a dispensation, which he granted June of that year, and on October 8, 1926, the Boston University Lodge was instituted U. D. (under dispensation) by District Deputy Grand Master Arthur E. Fisk, with charter members. The Grand Lodge, at its quarterly meeting last September, voted to grant a charter, and the Boston University Lodge became a duly recognized member of the fraternity September 29, 1926. Two deaths have occurred ai the original petitioners, Senior Warden Harold C. Spencer passed away Jan. 18, 1925, and Lee C. Hascall, a trustee and a graduate of the College of Liberal Arts, died July 1925. Boston University Lodge of Masons marked its 25th anniversary October 8 with special observances in the Marsh Chapel on the campus. Dr. Daniel L. Marsh, university president, presented the lodge with a gavel made of stone from the same quarry which supplied materials for Solomon's Temple. The gift was accepted by Alden Ackerman, Master of the lodge. Present were deans and trustees of the university. Roger Keith of Brockton, Grand Master of Masons in Massachusetts, and representatives of the Richard C. MacLaurin Lodge of M. I. T. and Harvard Lodge. Wor. John J. Daverio of Allston, a School of the Arts graduate and teaching associate, was installed Master of Boston University Lodge at the Boston Masonic Temple. Wor. Irving Wallace of Taunton, a graduate of the same school, was Installing Officer. This event marked the beginning of the Lodge's 59th year. Assisting Bro. Wallace in seating the new officers were Hubert I. Yorra of Randolph, a graduate of B.U. Law School, Installing Chaplain; and Irwin R. Macey of Lexington, a holder of A. B. and LL. D. degrees from B. U., as Installing Marshal. Other new officers of Boston U. Lodge are: John P. Whiteside of Reading, Senior Warden; Gerald Weale of Townsend, Junior Warden; Peter Moore of South Easton, Treasurer; Richard Moore of Lincoln, Secretary; Wor. Ira Smith of West Newton, Marshal; Gary Ferris of Marlboro, Senior Deacon; David Backus of Allston, Junior Deacon; also, Christos Georges of Hudson and David Famsworth of Aubumdale, Stewards; and John Reynolds of Boston, Inside Sentinel. All officers are graduates of Boston U.
Boston University Lodge is one of only three academic Lodges in the country. The Lodge meets the third Wednesday of each month. Following a recent meeting of Boston University Lodge. Wor. Master John Daverio is joined in the East by Wardens Gerry Weak (left) and John Whiteside (right). All three are teaching associates in the University's School of Music. Boston University Lodge officers wear the academic gowns and regalia signifying their tie to the University. The Masonic Home in Charlton was the setting last April 17 for the stated communication of Boston University Lodge. The meeting followed a dinner with the residents and a brief concert by the Boston University String Orchestra. The work for the evening was the conferring of the Fellow Craft Degree in the company of resident Masons and their guests. "The visit to Charlton," commented Wor. John Daverio, Master of the Lodge, "was the suggestion of Dr. William Stevenson, Lodge member and resident of the Home, and very much on the spur of the moment. We are delighted we could follow it through and I am sure the residents and their guests enjoyed it." Boston University Lodge, chartered in 1925, meets in Tuscan Hall, Masonic Temple, Boston, the third Wednesday of every month. One of the few academic Lodges in the country, it is joined in Massachusetts by The Harvard Lodge, also in the Boston 2nd District, and Richard C. Maclaurin Lodge (Mass. Institute of Technology), of the Cambridge 2nd District. Unlike most Lodges the officers of Boston University Lodge have replaced the traditional black tuxedos with scarlet gowns and hoods in recognition of the Lodge's tie to academia. The membership of Boston University Lodge is as diverse as the University's population. Over the years the Lodge has brought together students, faculty, presidents, deans, staff members, and alumni; every member of the Lodge must have a direct connection to Boston University. Representing nearly every area of academic interest and nearly every corner of the world, the members have brought to the Lodge a feeling of universal brotherhood. According to Secretary Richard Moore the University setting brings with it concerns not normally associated with Masonic Lodges. More than half of the Lodge's 200 members currently live out of state, many in other countries. Bro. Moore states that numerous graduate students have been Raised in the Lodge over the years, but upon graduating have left the area to take new jobs or to return to their families. Each month Lodge notices are sent to members worldwide. Although the members are spread far apart, there is a strong bond among them. The ties exist not only because of the Fraternity, but also because of loyalty to their Alma Mater. Deputy Grand Master, Rr. Wor. Robert V. Jolly, Jr. installs Wor. Scott M. Sherman. Academic robes are the standard of dress for BU Lodge. The lodge at Boston University was rechartered in June. Once again there are three academic lodges in Massachusetts: The Harvard Lodge, Richard C. MacLaurin Lodge at MIT, and Boston University Lodge. Wor. Scott M. Sherman was installed as master during a public installation ceremony held at the Grand Lodge building. The reemergence of BU Lodge after a 13-year hiatus was the result of years of hard work and dedication by more than 40 brothers, BU Lodge will be based at the Grand Lodge building and will be in the 2nd Masonic District. The curator for this page is Brother Scott Sherman. Please direct informational updates and questions to him. This page was last modified on 21 March 2019, at 15:23. This page has been accessed 43,167 times.